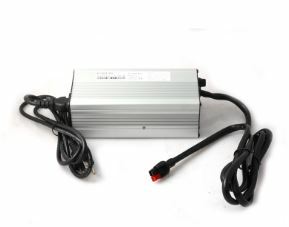 This Lithium Battery Wall Charger, 10 amp 14.6VDC is an AC-to-DC charger for use in charging 12V LiFePO4 batteries. This charger has an SAE connector that plugs directly into the Be Prepared Solar generator case. It will charge a 100Ah battery in 10 hours, the 200 Ah battery in 20 hours and the 300 Ah battery in 30 hours. The Battery Management System contained in our LiFePO4 batteries is designed to work well with this charger for years of excellent performance.